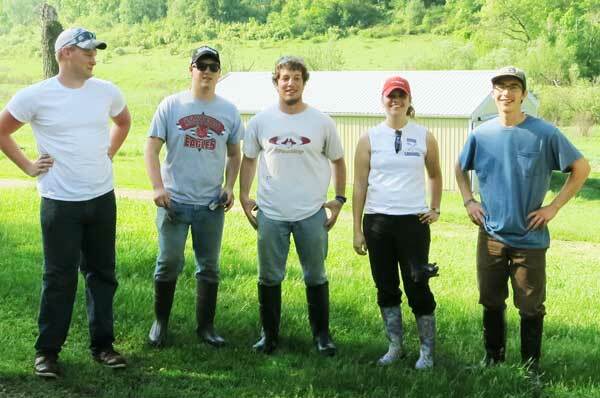 Yesterday we had our interns for the first day of the summer season. We have enjoyed having summer interns for the past 10 years or so. For most of these years we shared them with Madison Audubon Society but since The Prairie Enthusiasts has expanded its program, we are now working with them. Our PVC Crew (Susan, Amanda, and Kathie) participated in the selection and interview process, and Rich Henderson handled the final contacts. The interns will be working at Pleasant Valley Conservancy and Black Earth Rettenmund Prairie an average of 1 1/2 days per week. Amanda is serving her third year as intern supervisor at these two sites. For a student interested in restoration ecology, the intern program provides a good way of finding out what this subject is all about. It's hard work but educational. Yesterday, they learned about handling herbicides. 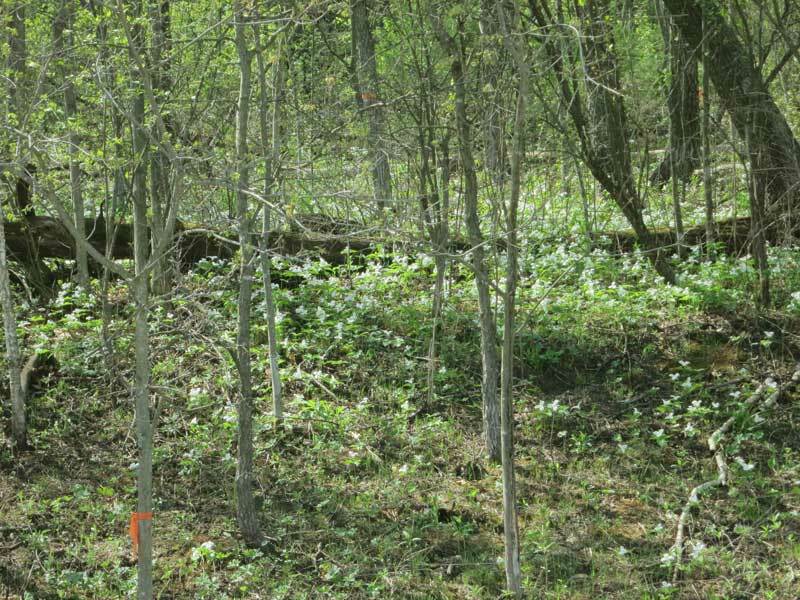 They then cut and treated honeysuckle in an area of the North Woods that got missed in last November's fire. 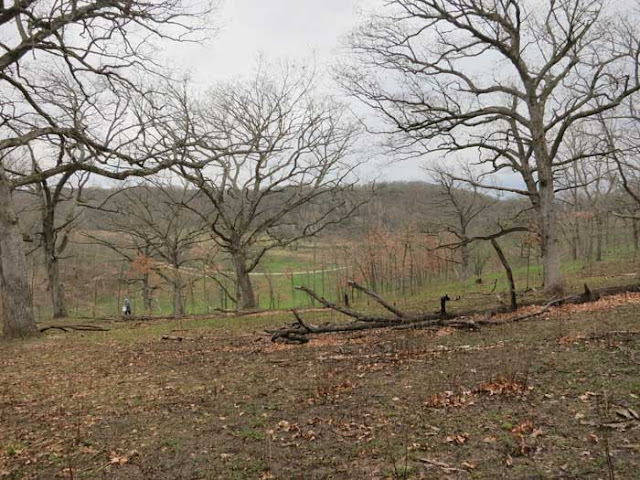 Buckthorn: what will mowing do? At Pleasant Valley Conservancy we have been dealing with buckthorn for over 15 years. During that time, we have probably tried every technique mentioned in the scientific literature. One method frequently mentioned is mowing, which appeals to those opposed to herbicides. Some sources state that if you mow three times a year for three years you will get rid of it. Kathie has been mowing our ridge-top trail for at least 15 years, at least three times a summer. She points out that despite this, small buckthorn can still be seen. The photo here is an example. There are at least three shoots that are connected. When you pull up plants like this, you find a massive fibrous root mass, with woody roots extending out in several directions. If you look carefully, you can generally see two or three cut stems left over from last year's mowing. Buckthorn shoots (not seedlings!) in an area that has been mowed about 3 times a year for the past 15 years. According to my tests, a brief spritz with 2-3% Garlon 3A, glyphosate, or 2,4-D will fix these plants so they won't come back. Things are picking up now at Pleasant Valley Conservancy. In addition to those early low-growing plants (early buttercup, wood anemone, violet wood sorrel, the two prairie violets), we are starting to see more upright plants. 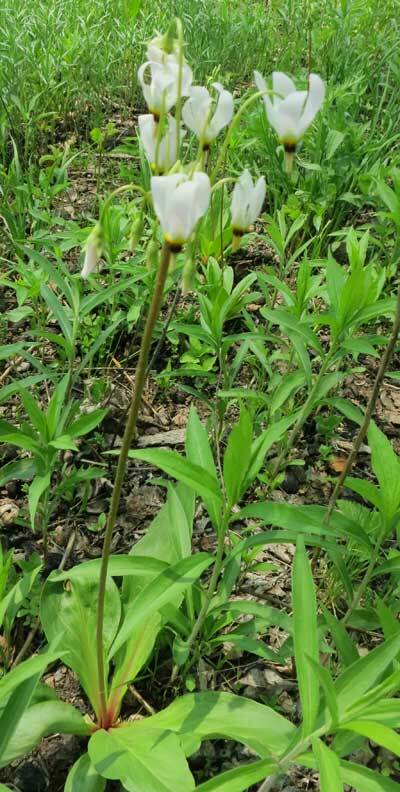 The two most common right now are shooting star (Dodecatheon meadii) and large-flowered trillium (Trillium grandiflorum). Although shooting star grows in prairies, it is really a savanna species, and we are seeing it now in virtually all our savannas. Because we had an especially good burn year, it is forming large populations. Shooting star has the ability to remain alive but suppressed in a heavily wooded savanna and then when sunlight is brought in during restoration, it flourishes. The White Oak Savanna and the East Basin have especially large amounts of shooting star which arose in that way. Shooting star can also be propagated from seed but generally takes six to seven years to flower. During those formative years it is virtually impossible to find in the wild, since the seeds are very tiny, as are the seedlings. During those early years, a substantial bulb is being formed. Once this bulb is established, it will generally flower every year. Large-flowered Trillium is a woodland species, a so-called spring ephemeral. In the Driftless Area of Dane County, this Trillium can often be seen from highways in large patches, often spreading down from the woods into the road cut. About 5 years ago I measured the population at Pleasant Valley Conservancy as 2.5 acres, but with our very successful burn last fall, the population is not only larger, but a new one has popped up. 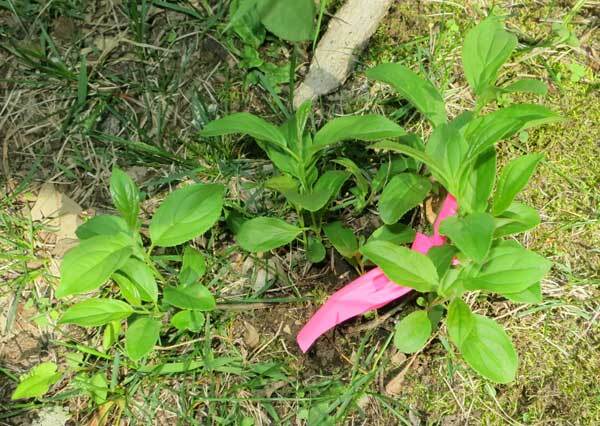 This is the time of year when weed plants are above ground and can be sprayed with herbicide. Unfortunately, shrubs that did not get top-killed by a burn are also leafing out. At Pleasant Valley Conservancy most of these shrubs are scattered, single, short stems, with four or five leafy buds. Although these stems should be sensitive to foliar spray, it is difficult to spray them without getting herbicide on nearby "good" plants. Here is a technique that works well under these conditions, provided you are using glyphosate (2% glyphosate; 41% active ingredient). If I see an isolated buckthorn stem leafing out I step on it and press it to the bare soil. Then I spray each leafed out bud. I don't worry if I get some herbicide on the soil, since it will cause no harm. The only limitation here is that there must be bare ground surrounding the shrub. In a few weeks the whole soil surface will be green. Once that condition is reached, the only way to selectively kill isolated stems is by basal bark, using a sponge on a stick. That technique is described in this link. 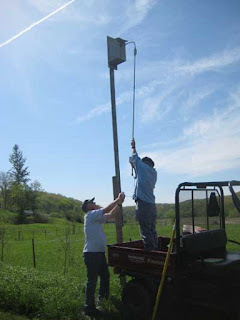 While they plant seeds and spray weeds, Susan and coworkers have been keeping track of bird species seen or heard. The list at end of this post has 55 species. Since this year more time has been spent than usual in the wetland, there are probably more wetland birds than in previous surveys. In addition to those on the list, confirmed sightings by Kathie and others include scarlet tanager and Cape May warbler. Also, most of the nest boxes in Kathie's bluebird trail have been occupied with bluebirds, many with 5 eggs. Roma will be doing another breeding bird survey before the end of the month. I don't know the details of the apparatus but assume it is some sort of mini inspection system. We thought we were finished with burns for spring 2013 but there had been one burn on our list which we had not done. This was a small but difficult burn at the corner of County Highway F and Pleasant Valley Road. This involves what we call Unit 14 plus the small quarry above that we are turning into a dry prairie. This area is difficult to incorporate into other burns. In addition, its aspect is such that it does not dry out quickly. Tuesday May 7 the weather conditions were perfect for this burn. The temperature was promised to be in the low 70's, R.H. around 25%, and wind out of the east at 5 mph. As the photo shows, this burn unit is surrounded with areas that had already been burned, plus the two highways. Because of this and the size of the burn, we could do it with a small crew (3 people). 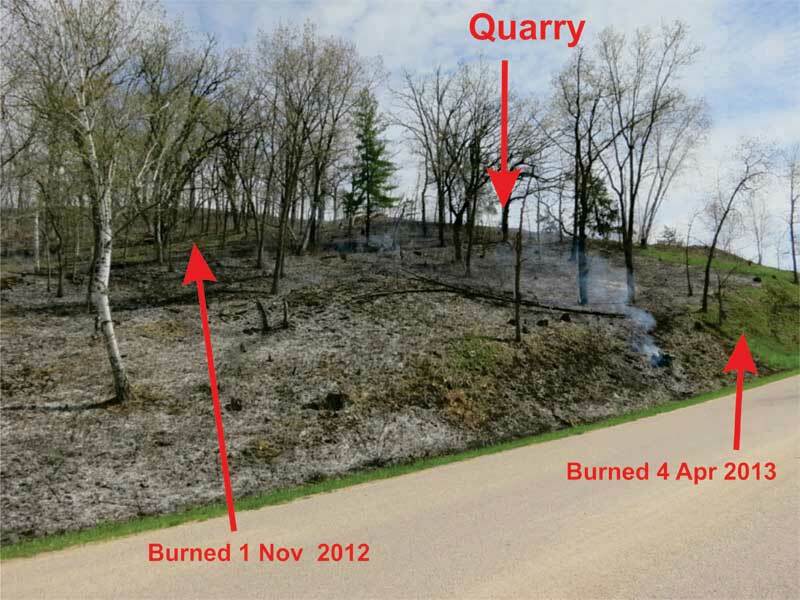 The quarry was burned first. Since this is contained within rock walls, no fire breaks were needed. Because of the burn conditions, the slope, and some flammable trees, the whole of Unit 14 was burned as a backfire. Because backburning is slow, it took about 1.5 hours to do this burn. Now we really are finished burns for the season! With our burns over, we have quickly started getting seeds on the ground in selected burn units. One of the major uses of a burn is to clear the site of duff, leaves, and debris so that broadcast seeds can reach the bare soil. Seeds were collected throughout 2012, cleaned, weighed, mixed, and bagged. A spreadsheet was prepared with the various units to be planted, how many acres, and what type of seed mix. 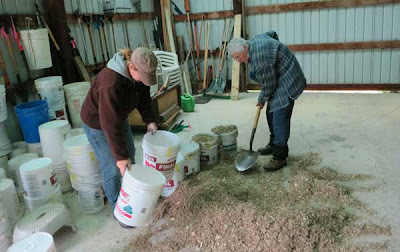 Six separate seed mixes had been prepared: Dry Prairie, Dry-Mesic Prairie, Open Savanna, Woods, Wet-Mesic, and Wetland. Areas that were burned last November were planted in early December (before the snows). The seeds for spring-planting were hung in the unheated barn until now. They were mixed with sawdust and distributed into buckets. A labeled flag was placed in each bucket showing which area the seeds were to be planted. Buckets were stacked in the Mule and delivered to the appropriate sites. An open savanna area ready for planting. This area had been burned 20 April 2013. Many of the areas at Pleasant Valley Conservancy have been planted several (or many) times. We feel this is necessary because the quality of seeds varies from year to year, and the weather conditions after planting also vary. At present, all of the seeds for this year are on the ground. Now it is time to move on to herbaceous weed control!